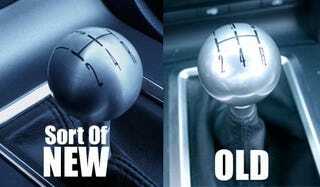 The teaser image du jour of theshift knob from the 2010 Ford Mustang looked familiar to us (and to a few readers). Although the bezel and plastic molding over the transmission tunnel is clearly new, that giant aluminum ball looks awfully familiar. Maybe because it appears to be the spittin' image of the one found in the 2008 Ford Mustang Bullitt we recently reviewed. Yes, that's right, you too can snag yourself the same shift knob as the 2010 Mustang for a wee fee of $109.95. Just remember though, in order to get the right fit, you'll have to order the shifter bezel and boot to go along with it. That'll set you back an additional $189.95. At these prices you're better off just buying the new 'stang.